On March 22, 1997, figure skater Tara Lipinski, age 14, became the youngest skater ever to win a World Championship. (Okay, she was actually 14 years and 9 months old for you nitpickers.) Prior to her history making performance at the World competition, Tara had won the United States National Championship and in 1998 would go on to win the Gold Medal at the Winter Olympic Games. Lipinski is only 1 of many young athletes who have excelled beyond their seemingly tender years, and today we list 10 such young athletic stars that strike us as particularly worth noting. Many teens have made their way into the Major Leagues of baseball and have competed as Olympic athletes, but some sports have limited the age of professionals to a minimum of 18 years old, making really, really young stars impossible. Some young athletes have even lied about their age in order to compete at a higher level. So many are worth mentioning! As always, feel free to mention other notable people that should be on this list. Question for Students (and others): Who is your favorite young athletic star? Please let us know in the comments section below this article. 1. Tara Lipiniski, World Champion Ice Skater, age 14. Lipinski in December 1998. Photograph by Kingkongphoto & www.celebrity-photos.com from Laurel Maryland, USA. 2. Joe Nuxhall, Major League Baseball Pitcher, age 15. In 1944, while most American able bodied men were in the military service during World War II, this teen aged prodigy made his major league debut as a left handed pitcher at the tender age of 15, the youngest major leaguer ever. Joe was no flash in the pan as his career with the Cincinnati Reds lasted until 1966, although interrupted by stops in Kansas City and Los Angeles. Along the way he managed to set the team record for pitching appearances (pitching in 484 games) and compiled a record of 135 wins and 115 1osses with an ERA of .390. Joe’s career in the major leagues lasted only the one game in 1944, until he worked his way back up to the “Big Show” in 1952. After his retirement as a player in 1966, Nuxhall went into broadcasting, a second career that lasted until his death in 2007 at the age of 79. Nuxhall was a product of Hamilton, Ohio. Joe Nuxhall was a 2 time National League All Star and is an inductee to the Cincinnati Reds Hall of Fame. 3. Marjorie Gestring, Olympic Gold Medal Diver, age 13. Special Mention: Kim Yun-mi broke Gestring’s age record at the 1994 Winter Olympics when she took the Gold Medal in the 3000 meter relay, a feat she repeated at the 1998 Winter Olympics. 4. Nadia Comăneci, Olympic Gold Medal Gymnast, age 14. Born in Onești, Romania in 1961, Nadia took the 1976 Summer Olympics and the world by storm by winning 3 Olympic Gold Medals in Gymnastics before she had turned 15 years old. Not only that, Nadia became the first ever Olympic gymnast to score a perfect 10 at an Olympic competition. For good measure she came back at the 1980 Olympic Games and won 2 additional Olympic Gold Medals. In all, Nadia earned 9 Olympic Medals, and won the hearts of millions of people across the world, greatly enhancing the popularity of the sport of gymnastics. Nadia has lived in the United States since 1989, with her husband, US Olympic gymnast Bart Connor. Special Mention: Prior to Nadia’s groundbreaking performance in 1976, Soviet gymnast Olga Korbut was the darling of the gymnastics world when she won 3 Olympic Gold Medals in ladies Gymnastics in 1972 (Team, Balance Beam, and Floor) at the age of 17. 5. Betty Robinson, Olympic Gold Medal 100 meter Dash, age 16. Betty Robinson was the first woman to win an Olympic gold medal in track and field, in the 100-meter race at the 1928 games. She was severely injured in a plane crash, but came back to win another gold in 1936. The 1928 Summer Olympic Games in Amsterdam would be the debut of the Women’s 100 Meter Dash competition, and a 16 year old girl from Riverdale, Illinois (born 1911) would become the first ever female Olympic 100 Meter Dash Gold Medalist. She also won a Silver Medal at the Amsterdam Olympics in 1928 in the Women’s 4 X 100 meter relay, and won another Gold Medal at the 1936 Berlin Olympics, again in the 4 X 100 meter relay. Amazingly, Betty’s first ever race was in March of 1928, and at her second race ever she tied the 100 Meter Dash world record for women! Her Olympic Gold Medal 100 meter dash was only her 3rd race in competition, and she again tied the Women’s World Record in that event. She attended Northwestern University in Evanston, Illinois. A victim in a serious plane crash in 1931, Betty was reportedly taken to the coroner’s office where a startled coroner found the injured girl was still alive, but later information proved that story to be mistaken. Unable to walk normally for the next 2 years, she of course missed out on the 1932 Olympics, but made her comeback in 1936 to earn that second Gold Medal. She went on a long life, dying in 1999 at the age of 87. 6. Lexi Thompson, Women’s US Open Golf Qualifier, age 12. Thompson at the 2013 Women’s British Open. Photograph by Wojciech Migda (Wmigda). Not surprisingly still an amateur golfer at the age of 12, Lexi became the youngest ever golfer to qualify for the Women’s US Open golf tournament in 2007, and remember, although she was an amateur, she was competing against the best professionals and amateurs in the world for a spot on tournament roster! Lexi turned professional in 2010 at the age of 15, and in 2011 she became the youngest ever winner of a professional women’s golf tournament LPGA) at the age of 16. Thompson also became the youngest winner of a Ladies European golf tournament event in 2011, and at the age of 19 won her first major tournament, the 2014 Kraft Nabisco Championship, at the time the second youngest female major tournament winner. She is still playing golf at the advanced age of 24! Lexi is a native of Coral Springs, Florida, and stands 6 feet tall. 7. Bob Mathias, Olympic Gold Medal Decathlon, age 17. Born in Tulare, California in 1930, Mathias became the “World’s Greatest Athlete” by winning the 1948 Olympic Decathlon at the London Olympics at the age of 17, an incredible feat. Bob matched his remarkable performance of 1948 by winning the 1952 Olympic Gold Medal in Decathlon at the 1952 Olympic Games in Helsinki. 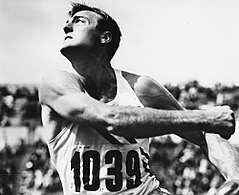 Bob’s 1952 performance was so dominating that he set a World Record in the Decathlon for margin of victory. Mathias later served for 8 years as a US Representative to Congress from California and held other government service jobs. He died of cancer at the age of 76 in 2006. Mathias attended Stanford University and even played 2 years of college football. 8. Wilfred Benítez, World Champion Boxer (Junior Welterweight Division), age 17. Benítez in 1980. Photograph by Prebbleqram. 9. Mike Tyson, World Champion Boxer (Heavyweight Division), age 20. Sports event poster publicizing the Berbick vs. Tyson professional boxing match on November 22, 1986. 10. Al Kaline, American League Batting Champion, age 20. Kaline with the Detroit Tigers in 1957. Original uploader was JGHowes at en.wikipedia. Kaline joined the Detroit Tigers at the age of 18 in 1953, bypassing the minor league development phase. In his third year of major league baseball, he stunned the American League by winning the Batting Championship with a batting average of .340, becoming the youngest player to win a major league batting title. Not since Ty Cobb in 1907 had a 20 year old won a batting title in the major leagues, though Kaline edged out Cobb in age. 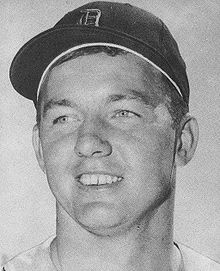 Al Kaline went on to a stellar career, posting a .297 lifetime batting average, smacking 3007 hits, and slamming 399 home runs while appearing in 18 All Star Games and winning 10 Gold Glove Awards. Gelman, Steve. Young baseball Champions. Norton, 1966. Gelman, Steve. Young Olympic Champions. Grosset & Dunlap, 1974. Sugar. Boxing’s Greatest Fighters. Gpq , 2006. The country of origin of this photograph is Italy. It is in the public domain there because its copyright term has expired. According to Law for the Protection of Copyright and Neighbouring Rights n.633, 22 April 1941 and later revisions, images of people or of aspects, elements and facts of natural or social life, obtained with photographic process or with an analogue one, including reproductions of figurative art and film frames of film stocks (Art. 87) are protected for a period of 20 years from creation (Art. 92). This provision shall not apply to photographs of writings, documents, business papers, material objects, technical drawings and similar products (Art. 87). Italian law makes an important distinction between “works of photographic art” and “simple photographs” (Art. 2, § 7). Photographs that are “intellectual work with creative characteristics” are protected for 70 years after the author’s death (Art. 32 bis), whereas simple photographs are protected for a period of 20 years from creation.